I went to the embroidery group meeting of my sewing guild today. A friend brought a new personal lamp to show. It is a Hug Light. I've never seen one before, but they are really neat! It is a flexible light with 2 super bright LEDs. You can wear it around your neck to shine on your work area. It runs on regular AAA alkaline batteries. She said she found a two-pack at Costco for $12.99 (item #527662). They are sold in other places for $20 each. I stopped by my local Costco on the way home and bought my own two-pack. I had a hard time finding them at first though - combed the hardware and home aisles. They turned out to be displayed with the laptops. Go figure. Here is my work space as usual. I have an Ott desk light on behind my machine, and the overhead room track lighting on. Work area without Hug Light. Same work space, but with the HugLight on high (there are three brightness levels, plus a red night light). Fill light added with Hug Light on. I showed these Hug Light things to two of my daughters, and one immediately adopted one for doing homework, and the other daughter took the second one to read in bed. I think I will go back to Costco and pick up another pair for our house, and maybe a couple more to give as gifts at Christmas. In case you are wondering what the embroidery was that I started in the photos above, it was a little Dumbo elephant on a child's blanket. 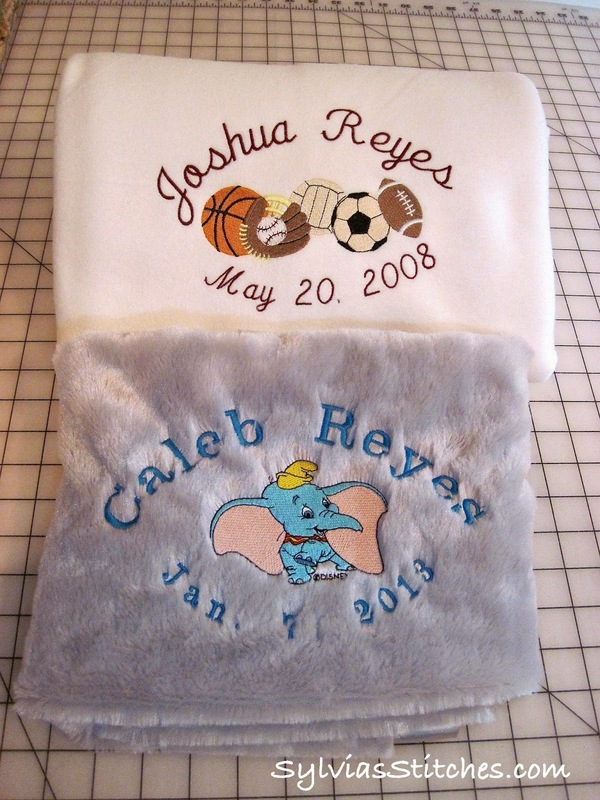 A friend had asked if I could embroider a couple of blankets for her boys. One is still an infant, and the other is five years old. She wanted their names and birthdates, plus a design of my choosing. 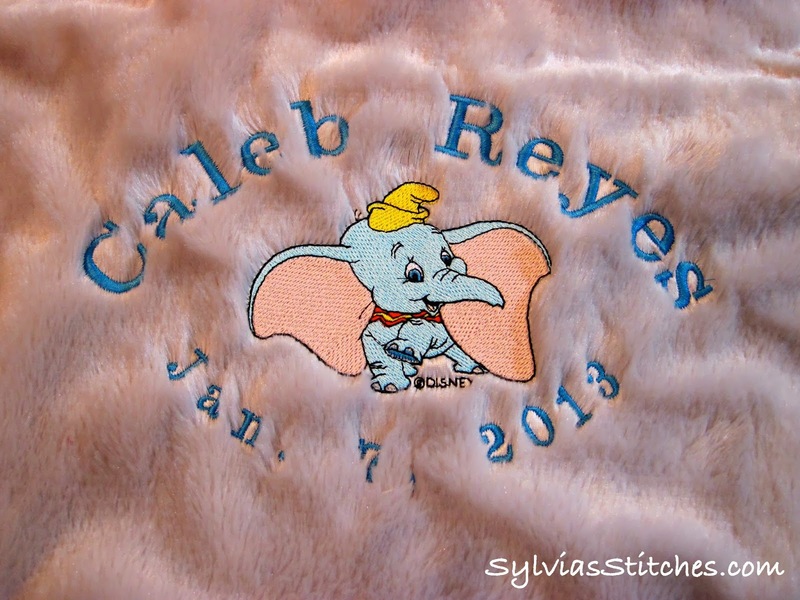 For the younger son, I chose a Disney design of Dumbo that was on my embroidery machine, and used a built-in font for the lettering. The older son likes sports, so I chose a sports design from EmbLibrary.com, and the "Lisa" font in the BES software. They turned out cute! The blankets are precious and I'm on my way to CostCo for some stocking stuffers. Thanks for the idea!